One Bite: ETS and Hot Summer Days - Perelandra Ltd. If you live in the U.S. or Canada, like us, you are in the middle of a severe heat wave (as if you didn't notice). Summer has just begun and it looks like we are in for another year of record-breaking and dangerous heat across the northern hemisphere. Keep these simple guidelines on hand and use ETS to support yourself, your companion animals and your plants, trees, garden, etc. Remember, the day need not be sunny for overexposure to sun. When you consider heat, let your good sense tell you it's a day for ETS. If you spend most of the summer months in an air-conditioned environment and your outside exposure is limited to about 15-25 minutes a day: Take 1 dose (1 Dose = A dropperful or 10-12 drops) of ETS each evening. 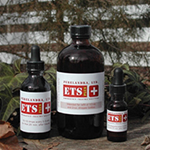 If you spend more than 30 minutes (at one time) in the sun, but don't exert yourself with more than sunbathing, walking or attending an outdoor show: Take 1 dose of ETS 3 to 4 times daily. If you work, exercise or play outdoors, especially during the heat of the day, or if you are more vulnerable to sun and heat because of your age, medications that cause sensitivity or for any other reason: Take 1 dose of ETS for Humans 4 to 6 times daily. 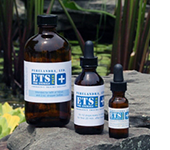 If the sun and heat are really getting to you: Take 1 dose of ETS every 5 minutes for 20 minutes. Then take ETS 3 times throughout the remainder of the day and 3 times daily for the next 2 days. Consider also taking an ETS Bath. 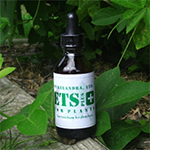 If you're going through a difficult heat spell and your plants are suffering, you may water or foliar feed (spray) them with an ETS for Plants solution once weekly throughout the hot period. For fields or crops, use the n.s. application to apply ETS for Plants one time weekly during the hot spell. See the Brochure. If summer weather is not your favorite time of year and the heat, bugs, sweat, long days with just too much sunshine annoy you, and you tend to sit around a lot with no energy waiting for the season to end, try setting up a PIC List test with "Summer Season Prep and Balance" as your focus.